Today’s review is for those people that like their grilled food spicy…and those that don’t. 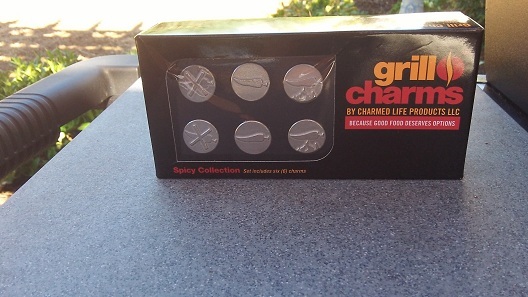 Leslie Haywood, Founder and President of Charmed Life Products and Inventor of Grill Charms was kind enough to send a box of the Spicy Collection Grill Charms for my review. The Spicy Collection comes with 2 each of the mild, medium and spicy charms. 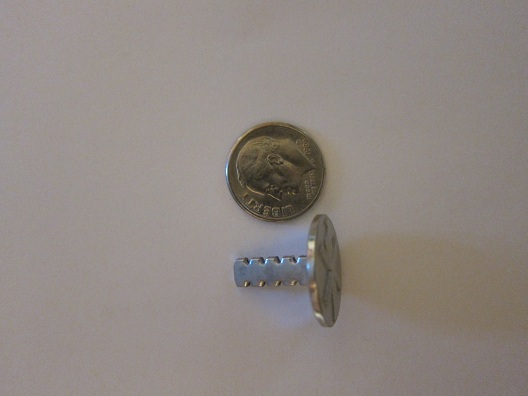 Grill Charms are dime-sized solid stainless steel charms that are placed in food before grilling. They have serrated stems which hold the charms in securely while flipping, moving and grilling food like you normally do and food cooks evenly around the charm. Grill Charms are great for use in distinguishing which foods have spices and flavors, steak temperatures, or to avoid health or allergy issues. This way when the food is done grilling you know which item goes to each person. 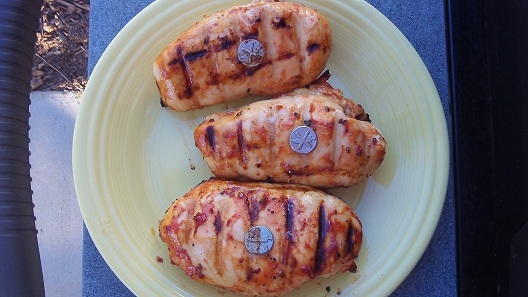 For this review I decided to grill Boneless BBQ Chicken Breasts. My family has different tastes when it comes to BBQ Sauce. I like a good spicy sauce and my wife and daughter like the non-spicy ones. I went to the store and picked up one bottle each of the Original and Chipotle Williamson Brothers Bar-B-Q sauces. When I got home I slathered up the three chicken breasts with sauce, my chicken in the Chipotle and my wife and daughter’s in the Original. 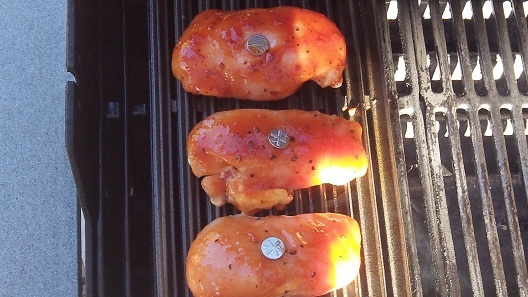 After that I placed the corresponding grill charms in our chicken and placed them on the grill. I felt safe knowing with the serrated stems that the Grill Charms would stay in place while flipping our chicken. I flipped the chicken and cooked them the remainder of the time needed. Once done I removed them from the grill and didn’t have to worry about mixing them up. I brought the chicken back in the house and placed them onto each family member’s plate and removed all the Grill Charms. It’s crazy to think that something as simple as the grill charms can make such a big difference in every day grilling. Before having these I always had to try and remember which foods had a spicy rub on them or spicy sauce. Grill Charms have solved this issue for me and I no longer have to worry about mixing up people’s food again. Plus having a 2 year old I don’t want to look over in shock and see her crying because she just bit into daddy’s Chipotle sauce covered chicken. My wife would have me sleeping on the couch for that one, lol. If you are like me and need a fun and safe way to distinguish between the different sauces and rubs you put on food, then the Grill Charms are a must buy for sure! Also, don’t forget Christmas is coming up and these would make a great stocking stuffer for your favorite griller! Hint Hint (Hope my wife sees this, I want a pack of the Steak Collection Grill Charms for my stocking!). There is also The Pink Collection, which Leslie donates 10% of the proceeds to The Breast Cancer Research Foundation! Cancer is something that has affected many families today, including Leslie and her mother. My mother is also in remission from cancer and my wife’s grandfather passed away from skin cancer, so this is something that hits close to home for us. A big thank you to Leslie for donating those proceeds to help find a cure! You can find a great deal on the Grill Charms here . You can find more information on Grill Charms on their Facebook and Twitter pages as well as their Website. Big thank you again to Leslie Haywood! Lil’ Bit of Q and I really enjoyed our non-spicy chicken! Thank you Grill Charms for helping my husband not mix up our chicken with his spicy chicken! He was so excited to use them for his review! Great fix! 🙂 Although, I am spoiled and have a husband who does it all!